AmaKhosi Safari Lodge in KwaZulu Natal, welcomes you to the kingdom of Zululand, where Kings celebrate the Big Five animals, namely Elephant, Rhino, Leopard, Lion and Buffalo. 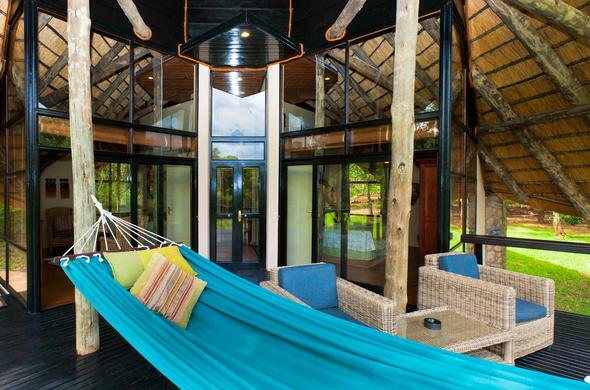 On the banks of Zululand's Mkuze River, you can find 10 000 hectares of prime game reserve. In Zulu, AmaKhosi means 'The Place of the Kings'; the service, luxury and dramatic surroundings bear testimony to its name. The varied ecosystem of savannah, mountains and wetlands allow for quality Big Five game viewing as well as Cheetah, Giraffe, Warthog, Hyena and more than 15 species of antelope, including the magnificent Nyala and rare Red Duiker. The wetlands area is an ideal ecosystem inhabited by Crocodile, Hippo and over 420 species of birds. Royal treatment offered at AmaKhosi Safari Lodge is the fully inclusive rate, that not only includes brunch (late breakfast), high tea (late lunch) and dinner, but also includes your morning and late afternoon game drives, sundowner cocktails in the bush, all local alcoholic and non-alcoholic beverages. Children, all ages welcome - babysitting facilities available upon request. Children can be taken on child game drives in the afternoon; parents are welcome to join their children.